The file manager (nautilus) icon in the Unity launcher is a folder with a pointer. That is a bug, because it puts a phantom pointer on the screen. The default icon there should be the home folder icon, and the icon should open the home folder (/home/<user>). We can either point nautilus.desktop to another file, or change this one. The impacts have to be looked at though. As mentioned in the bug report description, for the default folder icon to be the home folder icon, Unity needs to use the icon "/usr/share/icons/Humanity/places/48/user-home.svg"
This icon already exists, we just need to switch to the right icon. But changing the 'system-file-manager' icon to a 'Home folder' icon would be wrong. Its also used for the Applications menu items> (1)File Browser , (2)File Manager and system preferences menu item > (3)File Management. Replacing all these with the Home folder icon is not right. <didrocks> there was a hook for that case in maverick, not sure it survived natty though. So bitesizers, need to check if a nautilus-unity.desktop works and if that fixes this issue. So, just to highlight that the default should be "nautilus-unity.desktop" in the default unity gsettings favorites as well. Unity 2d hasn’t switched to gsettings yet, it’s still building its list of favorites from gconf. This will eventually happen but if we want to fix this bug in the meantime we’ll have to update the package’s default gconf settings. Could someone examine the patch, please? If the patch here was the only change done for this bug, looks like the patch only changed schema and no new nautilus-home.desktop file was added ? Just to clarify: the file nautilus-home.desktop is already built-in Ubuntu (on nautilus package). What I've done is change the *default* LauncherIcon to be nautilus-home.desktop (and not nautilus.desktop). This means that your current account will not be changed (because nautilus.desktop is in your favorite list). Try to create a new user on your computer and you'll see that the default icon is now the home icon (that opens /home/<user>). Sorry, guys, that's not a proper fix. Mark, but it's not a quite intrusive action simply change the favorite list of users? Anyway, if this will be done, the action must be thinked very well. When (I mean, in which part of Unity loading) the icon will be changed? And if the user puts the nautilus.desktop icon on launcher again? Unity shouldn't modify it again. And probably there is some other points to think about. Fair point. Please file a separate bug on the pointer-on-icon icon. The icon used is "user-home" which is the home directory one so the pointer-on-icon should be resolved? The pointer-on-folder icon will be resolved once humanity-icon-theme (0.5.3.5) hits the archives. Sorry guys, but the home folder icon is just not good enough. Please can we have a folder with a home on it, which follows the pattern established in the Humanity icon theme folder-recent.svg and folder-ubuntu.svg, which I attach as examples. The "big orange home" in user-home or folder-home is NOT A FOLDER and does not look like a folder and therefor does not fix the bug. 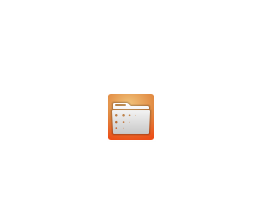 Also, we need the File Manger icon to look like a variation on a set-of-folders, NOT a filing cabinet. I'm marking this critical because this is the TOP item on the launcher for EVERY new user, and currently the icon fails to convey it's intended meaning. Reopening on Unity for desktop team visibility till it is fixed. Incomplete = blocked on design. I'll turn that in a UIF exception once we get the icon. Or, the way any partition or external-media-device is a folder in /media . And we dont etch a partition/device on a folder icon for either of them even though they are folders within a higher folder hierarchy. They are each Top levels for that location. No one wants to interact _with_ the Home(folder) , they want to interact with files or folders _inside_ Home . Further, so many actions are not available for interaction on the /home/$USER folder. It is better we differentiate it like how we differentiate the / and other devices. At a time when we are trying to move away from the hierarchal arrangement of folders, It is to eliminate that Home is a folder metaphor and to treat it as a higher level location like / or /media/$foo where folders exist. It is to show that Home is a similar higher level place where user just has _their_ folders or files . This icon change is inline with nautilus design specification for a "Consistent name for home", which calls for the use of name "Home" everywhere(not Home folder). I would rather like to see *some* attention focused on improving the user experience > Bug 372703 , we have a completed design specification and a patches in bugzilla and it has recently been fixed upstream too. But still we have been sitting on it since Karmic. If you only require user-home to be shown as a folder icon; pls *kindly* add it to ubuntu-mono which is set as the default icon theme for Ubuntu. I'm moving the task to ubuntu-mono where the change can be done. I think there is nothing more to do on unity. The unity task is already fix release. OK, thanks for the copy-paste, I'll reply on the humanity-icon bug. default. The icon should be a folder, with the home on it. a. Forward port the previous Folder-with-home from Humanity into unity-assert-pool/unity-icon-theme. b. Forward port the previous Folder-with-home from Humanity into ubuntu-mono. c. From-scratch design a symbolic Folder-with-home and put into unity-asset-pool/unity-icon-theme. d. From-scratch design a symbolic Folder-with-home and put into ubuntu-mono. or point to something other than 'nautilus.desktop'. Nota Bene to above. Compositing the Folder and House from Humanity elements probably creates a combined work. I believe Unity Asset Pool currently requires copyright assignment. Copyright assignment would require removing the copyright ownership from the Humanity/Tango authors (GPLv2/PD/GPLv3) before attempting to insert the result into the Ubuntu-Mono (CC-BY-SA-3.0) and Unity Asset Pool (CC-BY-SA-3.0 CAA Canonical). I have filed a request with Legal, about whether the icons, as "simple geometric shapes" are insignificant enough to fall outside copyright, in which case there would not be a problem, as the copyright would not need to be transferred. (FWIW, to my knowledge all of the authors are perfectly comfortable for their work to be used and under whatever licence is required). Also to note that Tango authors have noting to do with the Humanity folders, they are attributed in Humanity for other icons we may have used in the earlier releases of Humanity. I don't think the generic "file manager" icon should have a home on it. > I don't think the generic "file manager" icon should have a home on it. Cool! then that should solve Paul's worry about the copyright and unity asset pool..
Vish: sadly, the opposite. It means that the reference in 'nautilus.desktop' to 'Icon=system-file-manager' needs to be overridden (for Unity Launcher only); so that means putting an icon named 'system-file-manager' into 'unity-icon-theme'. Or coming up with new names, or new symlinks, or whipping up from-scratch a non-derived icon. Paul, ah! OK. My understanding was that if something from Humanity was being included, in unity-asset-pool to *hardcode* for the filemanager icon, there is this copyright problem. And thought that since Mark dint want the Home+folder icon from Humanity it wasnt an issue now. We are yet to come up with an acceptable generic icon for filemanager, and that new icon would not have anything to do with Humanity. Maybe we can use the old Unity places folder icon(it is already be in asset pool > browser.svg in http://bazaar.launchpad.net/~unity-team/unity-asset-pool/trunk/files/head:/unity-icon-theme/places/svg/). We could just draw the background orange; we'd be using unity-icon-theme and this was once an accepted icon for the Places launcher.. When I start nautilus I get a gray closet icon without a pointer; was that fixed and the bug not updated, or am I seeing something else? Pitti: the Unity Launcher part still needs doing into unity-asset-pool, so that it overrides what Nautilus looks like when on the Launcher (anything better than the original dull grey filing cabinet from 'gnome-icons') but doesn't override it in the rest of the system. I have updated my system and still not seeing the Home Folder in my launcher. The icons aren't reset on purpose with unity --reset, only the compiz configuration is. You have unity --reset-icons to explicitly reset all icons that are in your launcher to the default. Confirming that with today’s round of updates, in Unity 2D the default icon for the home folder in the launcher is the desired home folder icon.